In the world of professional design, we come across several misconceptions about marketing and design from those outside of our industry. Below are five truths that people tend to misconstrue about graphic design. Design is a multi-step process that starts with research before pen ever touches paper, then moves to sketching and finally working through different layouts, colors, and fonts. To make a design work, we take into account a myriad of design principles such as contrast, rhythm, color, scale, texture, repetition, among many others. The end result has likely gone through at least half a dozen revisions before the client sees it. This is to ensure the hierarchy, flow, and message are all clear and effective. 2. Knowing how to use Creative Cloud Suite does not make one a designer. When I was in design school, the focus in our classes was always on the layout, design choices, and employing the aforementioned design principles. Many untrained novices will be tempted by the cool effects that you can employ, or new tricks versus sticking to the brand standards. Most of my knowledge and skill in using Adobe Illustrator or Photoshop developed over many hours and years working in these programs beyond the classroom. If a design layout isn’t strong or effective, some flashy 3D text or doctored Photoshop image isn’t going to help. 3. Logos are not—and should not—be cheap. A lot of crowd-sourced design websites have popped up lately that offer a monetary “prize” to the designer that comes up with the “best” design for a company—an easy way to get a cheap, fast logo, albeit not well-crafted. When a company goes this route, they may not realize they're missing out on valuable research that a professional firm will devote to learning more about their industry, target audience, and competitors before even beginning the design process. The client/agency relationship is important in developing a strong brand that speaks for your whole company. Graphic design is a meaningful profession that will produce important results, just like any other specialized profession. A logo isn’t just a pretty mark; it’s a representation of the personality, voice, look, and feel of the brand. The logo leads the brand, and the brand needs to be effective throughout every touch point, and it must stand the test of time. 4. Design helps solve problems. Designers don’t just make things look nice, they solve problems with design-centered thinking that enhances understanding when combined with content and marketing strategy. The entire process takes into account how end users experience products and materials, and alerts to potential disconnects between perception and use of a brand. We also have a responsibility to ensure that what a client wants will work in the application, or to speak up if there might be a problem. For example, we were tasked to create a Directory for our client 616 Lofts's new building at 820 Monroe. We determined that they not only needed an easy-to-understand directory, but also required wayfinding for tenants and guests to ensure people could effectively navigate their biggest building yet. Images you get off the web are probably not at high enough resolution to be scaled up or to use in print. 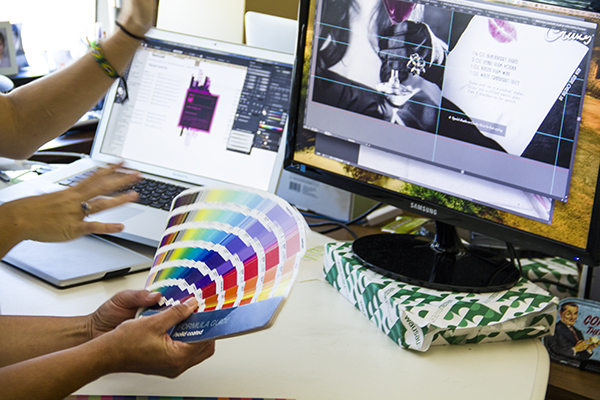 Resolution sizes should be 72 dpi (dots per inch) for web images and 300 dpi for print. Free fonts generally have marginal kerning (spacing between the letters) and shouldn’t be used unless a designer understands proper type practices and can adjust the spacing appropriately. Your favorite colors might not work for certain designs; color theory and psychology is important in selecting the right color to convey the right message, as well as to be readable in the chosen medium. Microsoft Publisher is not a program professional designers use, and will create issues with file sharing and printing. From billboards to business cards to the cardboard box that packages your mac n’ cheese, design is everywhere, and professional designers are behind it all.